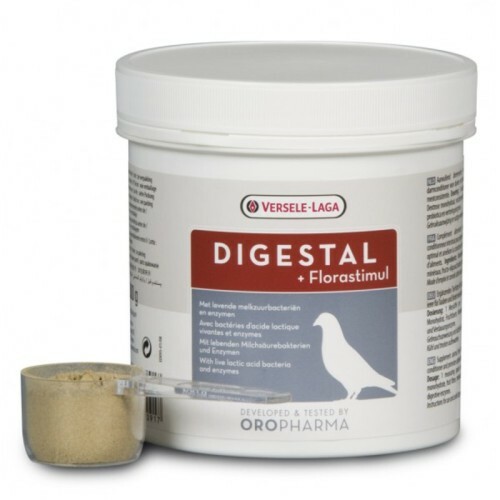 Versele Laga Digestal with florastimul provides intestinal condition with prebiotics. There are bacteria in the pigeons digestive tract which are essential for a good digestion. These good bacteria predominate in a healthy pigeon. However if pathogenic bacteria predominate the pigeon will have watery droppings resulting in a loss of large amounts of fluids and electrolytes. Administering antibiotics kills both good and pathogenic bacteria. Versele Laga Digestal serves as a food for the good intestinal flora (probiotics) and will also ensure that the pathogenic bacteria are no longer able to adhere to the intestinal wall so that the natural intestinal flora can recover. 1 measure per kg of feed. Dampen the feed in advance, eg with Ferti-Oil or Form-Oil-In-1. In all cases of watery diarrhoea (eg youngster disease). In youngsters: preventively two to three times a week from weaning. On arrival home after the race: for 2 days.